The aquaculture of salmonids is the farming and harvesting of salmonids under controlled conditions for both commercial and recreational purposes. Salmonids (particularly salmon and rainbow trout), along with carp, and tilapia are the three most important fish species in aquaculture. The most commonly commercially farmed salmonid is the Atlantic salmon. In the U.S. Chinook salmon and rainbow trout are the most commonly farmed salmonids for recreational and subsistence fishing through the National Fish Hatchery System. In Europe, brown trout are the most commonly reared fish for recreational restocking. Commonly farmed nonsalmonid fish groups include tilapia, catfish, sea bass, and bream. In 2007, the aquaculture of salmonids was worth US$10.7 billion globally. Salmonid aquaculture production grew over ten-fold during the 25 years from 1982 to 2007. In 2012, the leading producers of salmonids were Norway, Chile, Scotland and Canada. Much controversy exists about the ecological and health impacts of intensive salmonids aquaculture. Of particular concern are the impacts on wild salmon and other marine life. Some of this controversy is part of a major commercial competitive fight for market share and price between Alaska commercial salmonid fishermen and the rapidly evolving salmonid aquaculture industry. Very young fertilised salmon eggs, notice the developing eyes and vertebral column. Salmon egg hatching: In about 24 hr, it will be a fry without the yolk sac. The aquaculture or farming of salmonids can be contrasted with capturing wild salmonids using commercial fishing techniques. However, the concept of "wild" salmon as used by the Alaska Seafood Marketing Institute includes stock enhancement fish produced in hatcheries that have historically been considered ocean ranching. The percentage of the Alaska salmon harvest resulting from ocean ranching depends upon the species of salmon and location. Methods of salmonid aquaculture originated in late 18th-century fertilization trials in Europe. In the late 19th century, salmon hatcheries were used in Europe and North America. From the late 1950s, enhancement programs based on hatcheries were established in the United States, Canada, Japan, and the USSR. The contemporary technique using floating sea cages originated in Norway in the late 1960s. Salmonids are usually farmed in two stages and in some places maybe more. First, the salmon are hatched from eggs and raised on land in freshwater tanks. Increasing the accumulated thermal units of water during incubation reduces time to hatching. When they are 12 to 18 months old, the smolt (juvenile salmon) are transferred to floating sea cages or net pens anchored in sheltered bays or fjords along a coast. This farming in a marine environment is known as mariculture. There they are fed pelleted feed for another 12 to 24 months, when they are harvested. Norway produces 33% of the world's farmed salmonids, and Chile produces 31%. The coastlines of these countries have suitable water temperatures and many areas well protected from storms. Chile is close to large forage fisheries which supply fish meal for salmon aquaculture. Scotland and Canada are also significant producers. Modern salmonid farming systems are intensive. Their ownership is often under the control of huge agribusiness corporations, operating mechanized assembly lines on an industrial scale. In 2003, nearly half of the world’s farmed salmon was produced by just five companies. Modern commercial hatcheries for supplying salmon smolts to aquaculture net pens have been shifting to recirculating aquaculture systems (RAS)s where the water is recycled within the hatchery. This allows location of the hatchery to be independent of a significant fresh water supply and allows economical temperature control to both speed up and slow down the growth rate to match the needs of the net pens. Conventional hatchery systems operate flow-through, where spring water or other water sources flow into the hatchery. The eggs are then hatched in trays and the salmon smolts are produced in raceways. The waste products from the growing salmon fry and the feed are usually discharged into the local river. Conventional flow-through hatcheries, for example the majority of Alaska's enhancement hatcheries, use more than 100 tonnes (16,000 st) of water to produce a kg of smolts. An alternative method to hatching in freshwater tanks is to use spawning channels. These are artificial streams, usually parallel to an existing stream with concrete or rip-rap sides and gravel bottoms. Water from the adjacent stream is piped into the top of the channel, sometimes via a header pond to settle out sediment. Spawning success is often much better in channels than in adjacent streams due to the control of floods which in some years can wash out the natural redds. Because of the lack of floods, spawning channels must sometimes be cleaned out to remove accumulated sediment. The same floods which destroy natural redds also clean them out. Spawning channels preserve the natural selection of natural streams as no temptation exists, as in hatcheries, to use prophylactic chemicals to control diseases. However, exposing fish to wild parasites and pathogens using uncontrolled water supplies, combined with the high cost of spawning channels, makes this technology unsuitable for salmon aquaculture businesses. This type of technology is only useful for stock enhancement programs. Sea cages, also called sea pens or net pens, are usually made of mesh framed with steel or plastic. They can be square or circular, 10 to 32 m (33 to 105 ft) across and 10 m (33 ft) deep, with volumes between 1,000 and 10,000 m3 (35,000 and 353,000 cu ft). A large sea cage can contain up to 90,000 fish. They are usually placed side by side to form a system called a seafarm or seasite, with a floating wharf and walkways along the net boundaries. Additional nets can also surround the seafarm to keep out predatory marine mammals. Stocking densities range from 8 to 18 kg (18 to 40 lb)/m3 for Atlantic salmon and 5 to 10 kilograms (11 to 22 lb)/m3 for Chinook salmon. In contrast to closed or recirculating systems, the open net cages of salmonid farming lower production costs, but provide no effective barrier to the discharge of wastes, parasites, and disease into the surrounding coastal waters. Farmed salmon in open net cages can escape into wild habitats, for example, during storms. An emerging wave in aquaculture is applying the same farming methods used for salmonids to other carnivorous finfish species, such as cod, bluefin tuna, halibut, and snapper. However, this is likely to have the same environmental drawbacks as salmon farming. A second emerging wave in aquaculture is the development of copper alloys as netting materials. Copper alloys have become important netting materials because they are antimicrobial (i.e., they destroy bacteria, viruses, fungi, algae, and other microbes), so thery prevent biofouling (i.e., the undesirable accumulation, adhesion, and growth of microorganisms, plants, algae, tubeworms, barnacles, mollusks, and other organisms). By inhibiting microbial growth, copper alloy aquaculture cages avoid costly net changes that are necessary with other materials. The resistance of organism growth on copper alloy nets also provides a cleaner and healthier environment for farmed fish to grow and thrive. Salmonids are carnivorous and are currently being fed compound fish feeds containing fish meal and other feed ingredients, ranging from wheat byproducts to soybean meal and feather meal. Being aquatic carnivores, salmonids do not tolerate or properly metabolize many plant-based carbohydrates and use fats instead of carbohydrates as a primary energy source. With the amount of worldwide fish meal production being almost a constant amount for the last 30+ years and at maximum sustainable yield, much of the fish meal market has shifted from chicken and pig feed to fish and shrimp feeds as aquaculture has grown in this time. Work continues on substituting vegetable proteins and protein concentrates for fish meal in the salmonid diet. 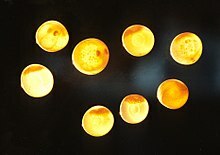 As of 2014, an enzymatic process can be used to lower the carbohydrate content of barley, making it a high-protein fish feed suitable for salmon. Many other substitutions for fish meal are known, and diets containing zero fish meal are possible. For example, a planned closed-containment salmon fish farm in Scotland uses ragworms, algae, and amino acids as feed. However, commercial economic animal diets are determined by least-cost linear programming models that are effectively competing with similar models for chicken and pig feeds for the same feed ingredients, and these models show that fish meal is more useful in aquatic diets than in chicken diets, where they can make the chickens taste like fish. Unfortunately, this substitution can result in lower levels of the highly valued omega-3 content in the farmed product. However, when vegetable oil is used in the growing diet as an energy source and a different finishing diet containing high omega-3 content fatty acids from either fish oil, algae oils, or some vegetable oils are used a few months before harvest, this problem is eliminated. Now, more than half of the world fish oil production is fed to farmed salmonids. Farm raised salmonids are also fed the carotenoids astaxanthin and canthaxanthin, so their flesh colour matches wild salmon, which also contain the same carotenoid pigments from their diet in the wild. On a dry-dry basis, 2–4 kg of wild-caught fish are needed to produce 1 kg of salmon. Wild salmon require about 10 kg of forage fish to produce 1 kg of salmon, as part of the normal trophic level energy transfer. The difference between the two numbers is related to farmed salmon feed containing other ingredients beyond fish meal and because farmed fish do not expend energy hunting. The American company Cargill has been researching with EWOS on alternative feeds in its RAPID feed and COMPASS programs in Norway. These methods studied macronutrient profiles of fish feed based upon geography and season. Using RAPID feed, salmon farms reduced the time to maturity of salmon to about 15 months, in a period one-fifth faster than usual. Modern harvesting methods are shifting towards using wet-well ships to transport live salmon to the processing plant. This allows the fish to be killed, bled, and filleted before rigor has occurred. This results in superior product quality to the customer, along with more humane processing. To obtain maximum quality, minimizing the level of stress is necessary in the live salmon until actually being electrically and percussively killed and the gills slit for bleeding. These improvements in processing time and freshness to the final customer are commercially significant and forcing the commercial wild fisheries to upgrade their processing to the benefit of all seafood consumers. An older method of harvesting is to use a sweep net, which operates a bit like a purse seine net. The sweep net is a big net with weights along the bottom edge. It is stretched across the pen with the bottom edge extending to the bottom of the pen. Lines attached to the bottom corners are raised, herding some fish into the purse, where they are netted. Before killing, the fish are usually rendered unconscious in water saturated in carbon dioxide, although this practice is being phased out in some countries due to ethical and product quality concerns. More advanced systems use a percussive-stun harvest system that kills the fish instantly and humanely with a blow to the head from a pneumatic piston. They are then bled by cutting the gill arches and immediately immersing them in iced water. Harvesting and killing methods are designed to minimize scale loss, and avoid the fish releasing stress hormones, which negatively affect flesh quality. Wild salmonids are captured from wild habitats using commercial fishing techniques. Most wild salmonids are caught in North American, Japanese, and Russian fisheries. The following table shows the changes in production of wild salmonids and farmed salmonids over a period of 25 years, as reported by the FAO. Russia, Japan and Alaska all operate major hatchery based stock enhancement programs that are really ocean ranching. The resulting fish hatchery fish are defined as "wild" for FAO and marketing purposes. Currently, much controversy exists about the ecological and health impacts of intensive salmonid aquaculture. Of particular concern are the impacts on wild salmonids and other marine life and on the incomes of commercial salmonid fishermen. However, the 'enhanced' production of salmon juveniles – which for instance lead to a double-digit proportion (20-50%) of the Alaska's yearly ‘wild’ salmon harvest - is not void of controversy, and the Alaska salmon harvest are highly dependent on the operation of Alaska’s Regional Aquaculture Associations. Furthermore, the sustainability of enhanced/hatchery-based ‘wild’ caught salmon has long been hotly debated, both from a scientific and political/marketing perspective. Such debate and positions were central to a 'halt' in the re-certification of Alaska salmon fisheries by the Marine Stewardship Council (MSC) in 2012. The Alaska salmon fisheries subsequently re-attained MSC-certification status; however the heavily hatchery-dependent Prince William Sound (PWS) unit of certification (“one of the most valuable fishing area in the State”) was for several years excluded from the MSC-certification (it remained ‘under assessment’ pending further analysis). In 1972, Gyrodactylus, a monogenean parasite, was introduced with live trout and salmon from Sweden (Baltic stocks are resistant to it) into government-operated hatcheries in Norway. From the hatcheries, infected eggs, smolt, and fry were implanted in many rivers with the goal to strengthen the wild salmon stocks, but caused instead devastation to some of the wild salmon populations affected. In 1984, infectious salmon anemia (ISAv) was discovered in Norway in an Atlantic salmon hatchery. Eighty percent of the fish in the outbreak died. ISAv, a viral disease, is now a major threat to the viability of Atlantic salmon farming. It is now the first of the diseases classified on List One of the European Commission’s fish health regimen. Amongst other measures, this requires the total eradication of the entire fish stock should an outbreak of the disease be confirmed on any farm. ISAv seriously affects salmon farms in Chile, Norway, Scotland, and Canada, causing major economic losses to infected farms. As the name implies, it causes severe anemia of infected fish. Unlike mammals, the red blood cells of fish have DNA, and can become infected with viruses. The fish develop pale gills, and may swim close to the water surface, gulping for air. However, the disease can also develop without the fish showing any external signs of illness, the fish maintain a normal appetite, and then they suddenly die. The disease can progress slowly throughout an infected farm, and in the worst cases, death rates may approach 100%. It is also a threat to the dwindling stocks of wild salmon. Management strategies include developing a vaccine and improving genetic resistance to the disease. In the wild, diseases and parasites are normally at low levels, and kept in check by natural predation on weakened individuals. In crowded net pens, they can become epidemics. Diseases and parasites also transfer from farmed to wild salmon populations. A recent study in British Columbia links the spread of parasitic sea lice from river salmon farms to wild pink salmon in the same river. The European Commission (2002) concluded, "The reduction of wild salmonid abundance is also linked to other factors but there is more and more scientific evidence establishing a direct link between the number of lice-infested wild fish and the presence of cages in the same estuary." It is reported that wild salmon on the west coast of Canada are being driven to extinction by sea lice from nearby salmon farms. These predictions have been disputed by other scientists and recent harvests have indicated that the predictions were in error. In 2011, Scottish salmon farming introduced the use of farmed wrasse for the purpose of cleaning farmed salmon of ectoparasites. Globally, salmon production fell around 9% in 2015, in large part due to acute outbreaks of sea lice in Scotland and Norway. Lasers are used to reduce lice infections. As of 2017, nearly half of Scotland’s salmon farms are infested with salmon lice. The problem is growing worldwide, with lice being far more resistant than the industry thought. Don Staniford, the former scientist turned activist and investigator, says that diseases are rife on fish farms, waste is out of control, and the use of chemicals is growing fast. According to him, the fish-farming industry is now close to destroying itself. Salmonid farms are typically sited in marine ecosystems with good water quality, high water exchange rates, current speeds fast enough to prevent pollution of the bottom but slow enough to prevent pen damage, protection from major storms, reasonable water depth, and a reasonable distance from major infrastructure such as ports, processing plants, and logistical facilities such as airports. Logistical considerations are significant, and feed and maintenance labor must be transported to the facility and the product returned. Siting decisions are complicated by complex, politically driven permitting problems in many countries that prevents optimal locations for the farms. In sites without adequate currents, heavy metals can accumulate on the benthos (seafloor) near the salmon farms, particularly copper and zinc. Contaminants are commonly found in the flesh of farmed and wild salmon. "...consumers should not eat farmed fish from Scotland, Norway and eastern Canada more than three times a year; farmed fish from Maine, western Canada and Washington state no more than three to six times a year; and farmed fish from Chile no more than about six times a year. Wild chum salmon can be consumed safely as often as once a week, pink salmon, Sockeye and Coho about twice a month and Chinook just under once a month." In 2005, Russia banned importing chilled fish from Norway, after samples of Norwegian farmed fish showed high levels of heavy metals. According to the Russian Minister of Agriculture Aleksey Gordeyev, levels of lead in the fish were 10 to 18 times higher than Russian safety standards and cadmium levels were almost four times higher. In 2006, eight Norwegian salmon producers were caught in unauthorized and unlabeled use of nitrite in smoked and cured salmon. Norway applies EU regulations on food additives, according to which nitrite is allowed as a food additive in certain types of meat, but not fish. Fresh salmon was not affected. A research paper from 2008 titled "Balancing the risks and benefits of fish for sensitive populations" contradicts the above recommendation in light of the fact that the levels of all in that study were on average 1%of that set as maximum by the FDA, CIA, and EFSA, and any risk posed by these contaminants is far outweighed by the proven benefits of eating farmed or wild salmon Due to this fact: Health Canada currently believes that no need exists for specific advice regarding fish consumption, vis-à-vis PCB exposure. Current Canadian dietary guidelines state recommend eating at least two Food Guide servings of fish each week and choosing fish such as char, herring, mackerel, salmon, sardines, and trout. The US in their dietary guidelines for 2010 recommends eating 8 ounces per week of a variety of seafood and 12 ounces for lactating mothers, with no upper limits set and no restrictions on eating farmed or wild salmon. "Update of the monitoring of levels of dioxins and PCBs in food and feed" to the European Food Safety Authority in July 2012 stated that farmed salmon and trout contained on average less dioxins and PCBs than wild-caught salmon and trout." Kurt Oddekalv, leader of the Green Warriors of Norway, argues that the scale of fish farming in Norway is unsustainable. Huge volumes of uneaten feed and fish excrement pollute the seabed, while chemicals designed to fight sea lice find their way into the food chain. He says: "If people knew this, they wouldn’t eat salmon", describing the farmed fish as "the most toxic food in the world". Don Staniford agrees, saying that a 10-fold increase in the use of some chemicals was seen in the 2016-2017 timeframe. The use of the toxic drug emamectin is rising fast. The levels of chemicals used to kill sea lice have breached environmental safety limits more than 100 times in the last 10 years. Farmed salmonids can, and often do, escape from sea cages. If the farmed salmonid is not native, it can compete with native wild species for food and habitat. If the farmed salmonid is native, it can interbreed with the wild native salmonids. Such interbreeding can reduce genetic diversity, disease resistance, and adaptability. In 2004, about 500,000 salmon and trout escaped from ocean net pens off Norway. Around Scotland, 600,000 salmon were released during storms. Commercial fishermen targeting wild salmon not infrequently catch escaped farm salmon. At one stage, in the Faroe Islands, 20 to 40 percent of all fish caught were escaped farm salmon. In 2017, about 263,000 farmed non-native Atlantic salmon escaped from a net in Washington waters in the 2017 Cypress Island Atlantic salmon pen break. Sea lice, particularly Lepeophtheirus salmonis and various Caligus species, including C. clemensi and C. rogercresseyi, can cause deadly infestations of both farm-grown and wild salmon. Sea lice are naturally occurring and abundant ectoparasites which feed on mucus, blood, and skin, and migrate and latch onto the skin of salmon during planktonic nauplii and copepodid larval stages, which can persist for several days. Large numbers of highly populated, open-net salmon farms can create exceptionally large concentrations of sea lice; when exposed in river estuaries containing large numbers of open-net farms, many young wild salmon are infected, and do not survive as a result. Adult salmon may survive otherwise critical numbers of sea lice, but small, thin-skinned juvenile salmon migrating to sea are highly vulnerable. In 2007, mathematical studies of data available from the Pacific coast of Canada indicated the louse-induced mortality of pink salmon in some regions was over 80%. Later that year, in reaction to the 2007 mathematical study mentioned above, Canadian federal fisheries scientists Kenneth Brooks and Simon Jones published a critique titled "Perspectives on Pink Salmon and Sea Lice: Scientific Evidence Fails to Support the Extinction Hypothesis " The time since these studies has shown a general increase in abundance of Pink Salmon in the Broughton Archipelago. Another comment in the scientific literature by Canadian Government Fisheries scientists Brian Riddell and Richard Beamish et al. came to the conclusion that there is no correlation between farmed salmon louse numbers and returns of pink salmon to the Broughton Archipelago. And in relation to the 2007 Krkosek extinction theory: "the data was [sic] used selectively and conclusions do not match with recent observations of returning salmon". A 2008 meta-analysis of available data shows that salmonid farming reduces the survival of associated wild salmonid populations. This relationship has been shown to hold for Atlantic, steelhead, pink, chum, and coho salmon. The decrease in survival or abundance often exceeds 50%. However, these studies are all correlation analysis and correlation doesn't equal causation, especially when similar salmon declines were occurring in Oregon and California, which have no salmon aquaculture or marine net pens. Independent of the predictions of the failure of salmon runs in Canada indicated by these studies, the wild salmon run in 2010 was a record harvest. A 2010 study that made the first use of sea lice count and fish production data from all salmon farms on the Broughton Archipelago found no correlation between the farm lice counts and wild salmon survival. The authors conclude that the 2001 stock collapse was not caused by the farm sea lice population. The study found that the farm sea lice population during the out-migration of juvenile pink salmon was greater in 2000 than that of 2001, but a record salmon escapement in 2001 exonerates sea lice of the year 2002 collapse due to the absence of negative correlation. The authors also note that initial studies had not investigated bacterial and viral causes for the event despite reports of bleeding at the base of the fins, a symptom often associated with infections, but not with sea lice exposure under laboratory conditions. Wild salmon are anadromous. They spawn inland in fresh water and when young migrate to the ocean where they grow up. Most salmon return to the river where they were born, although some stray to other rivers. Concern exists about of the role of genetic diversity within salmon runs. The resilience of the population depends on some fish being able to survive environmental shocks, such as unusual temperature extremes. The effect of hatchery production on the genetic diversity of salmon is also unclear. Salmon have been genetically modified in laboratories so they can grow faster. A company, Aqua Bounty Farms, has developed a modified Atlantic salmon which grows nearly twice as fast (yielding a fully grown fish at 16–18 months rather than 30), and is more disease resistant, and cold tolerant. It also requires 10% less food. This was achieved using a chinook salmon gene sequence affecting growth hormones, and a promoter sequence from the ocean pout affecting antifreeze production. Normally, salmon produce growth hormones only in the presence of light. The modified salmon does not switch growth hormone production off. The company first submitted the salmon for FDA approval in 1996. In 2015, FDA has approved the AquAdvantage Salmon for commercial production. A concern with transgenic salmon is what might happen if they escape into the wild. One study, in a laboratory setting, found that modified salmon mixed with their wild cohorts were aggressive in competing, but ultimately failed. Sea cages can attract a variety of wild predators which can sometimes become entangled in associated netting, leading to injury or death. In Tasmania, Australian salmon-farming sea cages have entangled white-bellied sea eagles. This has prompted one company, Huon Aquaculture, to sponsor a bird rehabilitation centre and try more robust netting. The use of forage fish for fish meal production has been almost a constant for the last 30 years and at the maximum sustainable yield, while the market for fish meal has shifted from chicken, pig, and pet food to aquaculture diets. The fact that this market shift at constant production is an economic decision having no impact on the forage fish harvest rates for fish meal implies that the development of salmon aquaculture had no impact on forage fish harvest rates. Fish do not actually produce omega-3 fatty acids, but instead accumulate them from either consuming microalgae that produce these fatty acids, as is the case with forage fish like herring and sardines, or as is the case with fatty predatory fish, like salmon, by eating prey fish that have accumulated omega-3 fatty acids from microalgae. To satisfy this requirement, more than 50% of the world fish oil production is fed to farmed salmon. In addition, salmon require nutritional intakes of protein, which is often supplied to them in the form of fish meal as the lowest-cost alternative protein. Consequently, farmed salmon consume more fish than they generate as a final product, though considerably more preferred as food. “ 1. Benthic impacts and siting: Chemicals and excess nutrients from food and feces associated with salmon farms can disturb the flora and fauna on the ocean bottom (benthos). 2. Chemical inputs: Excessive use of chemicals – such as antibiotics, anti-foulants and pesticides – or the use of banned chemicals can have unintended consequences for marine organisms and human health. 3. Disease/parasites: Viruses and parasites can transfer between farmed and wild fish, as well as among farms. 4. Escapes: Escaped farmed salmon can compete with wild fish and interbreed with local wild stocks of the same population, altering the overall pool of genetic diversity. 5. Feed: A growing salmon farming business must control and reduce its dependency upon fishmeal and fishoil – a primary ingredient in salmon feed—so as not to put additional pressure on the world's fisheries. Fish caught to make fishmeal and oil currently represent one-third of the global fish harvest. 6. Nutrient loading and carrying capacity: Excess food and fish waste in the water have the potential to increase the levels of nutrients in the water. This can cause the growth of algae, which consumes oxygen that is meant for other plant and animal life. 7. Social issues: Salmon farming often employs a large number of workers on farms and in processing plants, potentially placing labor practices and worker rights under public scrutiny. Additionally, conflicts can arise among users of the shared coastal environment. Another form of salmon production, which is safer but less controllable, is to raise salmon in hatcheries until they are old enough to become independent. They are then released into rivers, often in an attempt to increase the salmon population. This practice was very common in countries such as Sweden before the Norwegians developed salmon farming, but is seldom done by private companies, as anyone may catch the salmon when they return to spawn, limiting a company's chances of benefiting financially from their investment. Because of this, the method has mainly been used by various public authorities and nonprofit groups, such as the Cook Inlet Aquaculture Association, as a way of artificially increasing salmon populations in situations where they have declined due to overharvest, construction of dams, and habitat destruction or disruption. Unfortunately, negative consequences to this sort of population manipulation can occur, including genetic "dilution" of the wild stocks, and many jurisdictions are now beginning to discourage supplemental fish planting in favour of harvest controls and habitat improvement and protection. A variant method of fish stocking, called ocean ranching, is under development in Alaska. There, the young salmon are released into the ocean far from any wild salmon streams. When it is time for them to spawn, they return to where they were released where fishermen can then catch them. In their natal streams, Atlantic salmon are considered a prized recreational fish, pursued by avid fly anglers during its annual runs. At one time, the species supported an important commercial fishery and a supplemental food fishery. However, the wild Atlantic salmon fishery is commercially dead; after extensive habitat damage and overfishing, wild fish make up only 0.5% of the Atlantic salmon available in world fish markets. The rest are farmed, predominantly from aquaculture in Chile, Canada, Norway, Russia, the United Kingdom, and Tasmania. Atlantic salmon is, by far, the species most often chosen for farming. It is easy to handle, grows well in sea cages, commands a high market value, and adapts well to being farmed away from its native habitats. Adult male and female fish are anesthetized. Eggs and sperm are "stripped", after the fish are cleaned and cloth dried. Sperm and eggs are mixed, washed, and placed into fresh water. Adults recover in flowing, clean, well-aerated water. Some researchers have studied cryopreservation of the eggs. Fry are generally reared in large freshwater tanks for 12 to 20 months. Once the fish have reached the smolt phase, they are taken out to sea, where they are held for up to two years. During this time, the fish grow and mature in large cages off the coasts of Canada, the United States, or parts of Europe. Generally, cages are made of two nets; inner nets, which wrap around the cages, hold the salmon while outer nets, which are held by floats, keep predators out. Many Atlantic salmon escape from cages at sea. Those salmon that further breed tend to lessen the genetic diversity of the species leading to lower survival rates, and lower catch rates. On the West Coast of North America, the non-native salmon could be an invasive threat, especially in Alaska and parts of Canada. This could cause them to compete with native salmon for resources. Extensive efforts are underway to prevent escapes and the potential spread of Atlantic salmon in the Pacific and elsewhere. The risk of Atlantic Salmon becoming a legitimate invasive threat on the Pacific Coast of N. America is questionable in light of both Canadian and American governments deliberately introducing this species by the millions for a 100-year period starting in the 1900s. Despite these deliberate attempts to establish this species on the Pacific coast; no established populations have been reported. In 2007, 1,433,708 tonnes of Atlantic salmon were harvested worldwide with a value of $7.58 billion. Ten years later, in 2017, over 2 million tonnes of farmed Atlantic salmon were harvested. In 1989, steelhead were reclassified into the Pacific trout as Oncorhynchus mykiss from the former binominals of Salmo gairdneri (Columbia River redband trout) and S. irideus (coastal rainbow trout). Steelhead are an anadromous form of rainbow trout that migrate between lakes and rivers and the ocean, and are also known as steelhead salmon or ocean trout. Steelhead are raised in many countries throughout the world. Since the 1950s, production has grown exponentially, particularly in Europe and recently in Chile. Worldwide, in 2007, 604,695 tonnes of farmed steelhead were harvested, with a value of $2.59 billion. The largest producer is Chile. In Chile and Norway, the ocean-cage production of steelhead has expanded to supply export markets. Inland production of rainbow trout to supply domestic markets has increased strongly in countries such as Italy, France, Germany, Denmark, and Spain. Other significant producing countries include the United States, Iran, Germany, and the UK. Rainbow trout, including juvenile steelhead in fresh water, routinely feed on larval, pupal, and adult forms of aquatic insects (typically caddisflies, stoneflies, mayflies, and aquatic dipterana). They also eat fish eggs and adult forms of terrestrial insects (typically ants, beetles, grasshoppers, and crickets) that fall into the water. Other prey include small fish up to one-third of their length, crayfish, shrimp, and other crustaceans. As rainbow trout grow, the proportion of fish consumed increases in most populations. Some lake-dwelling forms may become planktonic feeders. In rivers and streams populated with other salmonid species, rainbow trout eat varied fish eggs, including those of salmon, brown and cutthroat trout, mountain whitefish, and the eggs of other rainbow trout. Rainbows also consume decomposing flesh from carcasses of other fish. Adult steelhead in the ocean feed primarily on other fish, squid, and amphipods. Cultured steelhead are fed a diet formulated to closely resemble their natural diet that includes fish meal, fish oil, vitamins and minerals, and the carotenoid asthaxanthin for pigmentation. The steelhead is especially susceptible to enteric redmouth disease. Considerable research has been conducted on redmouth disease, as its implications for steelhead farmers are significant. The disease does not affect humans. The Coho salmon is the state animal of Chiba, Japan. Coho salmon mature after only one year in the sea, so two separate broodstocks (spawners) are needed, alternating each year. [dubious – discuss] Broodfish are selected from the salmon in the seasites and "transferred to freshwater tanks for maturation and spawning". Worldwide, in 2007, 115,376 tonnes of farmed Coho salmon were harvested with a value of $456 million. Chile, with about 90 percent of world production, is the primary producer with Japan and Canada producing the rest. Worldwide, in 2007, 11,542 tonnes (1,817,600 st) of farmed Chinook salmon were harvested with a value of $83 million. New Zealand is the largest producer of farmed king salmon, accounting for over half of world production (7,400 tonnes in 2005). Most of the salmon are farmed in the sea (mariculture) using a method sometimes called sea-cage ranching, which takes place in large floating net cages, about 25 m across and 15 m deep, moored to the sea floor in clean, fast-flowing coastal waters. Smolt (young fish) from freshwater hatcheries are transferred to cages containing several thousand salmon, and remain there for the rest of their lives. They are fed fishmeal pellets high in protein and oil. Chinook salmon are also farmed in net cages placed in freshwater rivers or raceways, using techniques similar to those used for sea-farmed salmon. A unique form of freshwater salmon farming occurs in some hydroelectric canals in New Zealand. A site in Tekapo, fed by fast, cold waters from the Southern Alps, is the highest salmon farm in the world, 677 m (2,221 ft) above sea level. Before they are killed, cage salmon are sometimes anaesthetised with a herbal extract. They are then spiked in the brain. The heart beats for a time as the animal is bled from its sliced gills. This method of relaxing the salmon when it is killed produces firm, long-keeping flesh. Lack of disease in wild populations and low stocking densities used in the cages means that New Zealand salmon farmers do not use antibiotics and chemicals that are often needed elsewhere. 1527: The life history of the Atlantic salmon is described by Hector Boece of the University of Aberdeen, Scotland. 1763: Fertilization trials for Atlantic salmon take place in Germany. Later biologists refined these in Scotland and France. 1854: Salmon spawing beds and rearing ponds built along the bank of a river by the Dohulla Fishery, Ballyconneely, Ireland. 1892: Hatchery raised Atlantic salmon fry were released in the Umkomass river in South Africa in a failed attempt to establish a population in Africa. Late 19th century: Salmon hatcheries are used in Europe, North America, and Japan to enhance wild populations. 1961: Hatchery raised Atlantic salmon fry were released in the rivers of the Falkland Islands in a failed attempt to establish a population in the South Atlantic. Late 1960s: First salmon farms established in Norway and Scotland. 1970: Hatchery raised Atlantic salmon fry were released in the rivers of the Kerguelen Islands in a failed attempt to establish a population in the Indian Ocean. Early 1970s: Salmon farms established in North America. 1975: Gyrodactylus, a small monogenean parasite, spreads from Norwegian hatcheries to wild salmon, probably by means of fishing gear, and devastates some wild salmon populations. Late 1970s: Salmon farms established in Chile and New Zealand. 1984: Infectious salmon anemia, a viral disease, is discovered in a Norwegian salmon hatchery. Eighty percent of the involved fish die. 1985: Salmon farms established in Australia. 1987: First reports of escaped Atlantic salmon being caught in wild Pacific salmon fisheries. 1988: A storm hits the Faroe Islands releasing millions of Atlantic salmon. 1989: Furunculosis, a bacterial disease, spreads through Norwegian salmon farms and wild salmon. 1996: World farmed salmon production exceeds wild salmon harvest. 2007: A 10-square-mile (26 km2) swarm of Pelagia noctiluca jellyfish wipes out a 100,000 fish salmon farm in Northern Ireland. 2019: The first salmon fish farm in the Middle East is established in the United Arab Emirates. Chapter 14 of Paul Torday's 2007 novel Salmon Fishing in the Yemen includes a description of a visit to the "McSalmon Aqua Farms" where salmon are raised caged in a sea loch in Scotland. ^ "Fish Farming Information and Resources". farms.com. Retrieved November 25, 2018. ^ Joseph John Charbonneau; James Caudill (September 2010). "Conserving America's Fisheries-An Assessment of Economic Contributions from Fisheries and Aquatic Resource Conservation" (PDF). US Fish and Wildlife Service. p. 20. Retrieved 2015-01-21. ^ "Cultured Aquatic Species Information Programme Salmo trutta". Food and Agriculture Organization of the United Nations. Retrieved 2015-01-21. ^ "Responsible Sourcing Guide: Farmed Atlantic Salmon" (PDF). Seafish. 2015. Retrieved November 25, 2018. ^ "Commercial Fisheries". Alaska Department of Fish and Game. Retrieved 2015-01-12. ^ a b c Knapp, Gunnar; Roheim, Cathy A.; Anderson, James L. (January 2007). The Great Salmon Run: Competition Between Wild And Farmed Salmon (PDF) (Report). World Wildlife Fund. ISBN 0-89164-175-0. ^ "Incubation Biology". METRO EAST ANGLERS. Retrieved 27 March 2016. ^ a b "Sea Lice and Salmon: Elevating the dialogue on the farmed-wild salmon story" (PDF). Watershed Watch Salmon Society. 2004. Retrieved 2015-01-22. ^ FAO: World Review of Fisheries and Aquaculture 2008 Rome. ^ a b c "Farmed Seafood". World Wildlife Fund. Retrieved 2015-01-21. ^ a b c d e "It's all about salmon-Salmon Aquaculture" (PDF). Seafood Choices Alliance. Spring 2005. Retrieved 2015-01-21. ^ a b c d e f FAO: Cultured Aquatic Species Information Programme: Oncorhynchus kisutch (Walbaum, 1792) Rome. Retrieved 8 May 2009. ^ Naylor R. L. (2005) "Search for Sustainable Solutions in Salmon Aquaculture" Stanford University. ^ a b Shepherd, Jonathan; Jackson, Andrew and Mittaine, Jean-Francois (July 4, 2007) Fishmeal industry overview. International Fishmeal and Fish Oil Organisation. ^ Durham, Sharon (2010-10-13). "Alternative Fish Feeds Use Less Fishmeal and Fish Oils". USDA Agricultural Research Service. Retrieved 2014-09-09. ^ Kadir Alsagoff, Syed A.; Clonts, Howard A.; Jolly, Curtis M. (1990). "An integrated poultry, multi-species aquaculture for Malaysian rice farmers: A mixed integer programming approach". Agricultural Systems. 32 (3): 207–231. doi:10.1016/0308-521X(90)90002-8. ^ Bell, J.G. ; Pratoomyot, J.; Strachan, F.; Henderson, R.J.; Fontanillas, R.; Hebard, A.; Guy, D.R. ; Hunter, D.; Tocher, D.R. (2010). "Growth, flesh adiposity and fatty acid composition of Atlantic salmon (Salmo salar) families with contrasting flesh adiposity: Effects of replacement of dietary fish oil with vegetable oils". Aquaculture. 306 (1–4): 225–232. doi:10.1016/j.aquaculture.2010.05.021. ^ a b FAO: World Review of Fisheries and Aquaculture 2008: Highlights of Special Studies Rome. ^ "Pigments in Salmon Aquaculture: How to Grow a Salmon-coloured Salmon". seafoodmonitor.com. Archived from the original on 2004-09-02. Retrieved 2007-08-26. Astaxanthin (3,3'-hydroxy-β,β-carotene-4,4'-dione) is a carotenoid pigment, one of a large group of organic molecules related to vitamins and widely found in plants. In addition to providing red, orange, and yellow colours to various plant parts and playing a role in photosynthesis, carotenoids are powerful antioxidants, and some (notably various forms of carotene) are essential precursors to vitamin A synthesis in animals. ^ Naylor, Rosamond L. (1998). "Nature's Subsidies to Shrimp and Salmon Farming" (PDF). Science. 282 (5390): 883–884. doi:10.1126/science.282.5390.883. Archived from the original (PDF) on 2009-03-26. ^ "Cargill, an intensely private firm, sheds light on the food chain". The Economist. Retrieved 2017-09-11. ^ "CARGILL AQUA NUTRITION SUSTAINABILITY REPORT 2016" (PDF). cargill.com. p. 20. Retrieved 2017-09-11. ^ FAO: Species fact sheets Rome. ^ Charron Bertrand, Seafood Intelligence (April 2014). "Of Fairness… Seafood Watch & Farmed Salmon". www.seafoodintelligence.com. ^ Charron Bertrand, SeafoodIntelligence.com (May 2012). "Alaska salmon: ASMI vs. MSC?". Seafood Intelligence. ^ Alaska Department of Fish and Game (ADF&G), Press Release (October 16, 2015). "2015 Alaska Preliminary Commercial Salmon Harvest and Exvessel Values". adfg.alaska.gov. ^ a b Stead, Selina M.; Laird, Lindsay (14 January 2002). The Handbook of Salmon Farming. Springer Science & Business Media. pp. 348–. ISBN 978-1-85233-119-1. ^ Fact Sheet – Atlantic Salmon Aquaculture Research Archived 2010-12-29 at the Wayback Machine Fisheries and Oceans Canada. Retrieved 12 May 2009. ^ a b Krkosek, M.; Ford, J. S.; Morton, A.; Lele, S.; Myers, R. A.; Lewis, M. A. (2007). "Declining Wild Salmon Populations in Relation to Parasites from Farm Salmon". Science. 318 (5857): 1772–5. doi:10.1126/science.1148744. PMID 18079401. ^ a b Riddell, B. E.; Beamish, R. J.; Richards, L. J.; Candy, J. R. (2008). "Comment on "Declining Wild Salmon Populations in Relation to Parasites from Farm Salmon"". Science. 322 (5909): 1790. doi:10.1126/science.1156341. PMID 19095926. ^ Cleaner-fish keep salmon healthy by eating lice. Bbc.com (14 August 2015). Retrieved on 2016-10-26. ^ Integrated Sea Lice Management Strategies – Scottish Salmon Producers' Organisation. Scottishsalmon.co.uk (2013-11-23). Retrieved on 2016-10-26. ^ Sarah Butler (2017-01-13). "Salmon retail prices set to leap owing to infestations of sea lice". The Guardian. The Guardian. Retrieved January 25, 2017. ^ Gwynn Guilford (22 Jan 2017). "The gross reason you'll be paying a lot more for salmon this year". Quartz. Retrieved January 25, 2017. ^ Sarah Knapton (12 August 2017). "Salmon farming has done 'enormous harm' to fish and environment, warns Jeremy Paxman". The Telegraph. The Telegraph. ^ Dumiak, Michael. "Lice-Hunting Underwater Drone Protects Salmon With Lasers". IEEE Spectrum: Technology, Engineering, and Science News. Retrieved 2017-06-05. ^ a b Vidal, John (2017-01-01). "Salmon farming in crisis: 'We are seeing a chemical arms race in the seas'". The Guardian. Retrieved 2018-02-09. ^ a b Lang S. S. (2005) "Stick to wild salmon unless heart disease is a risk factor, risk/benefit analysis of farmed and wild fish shows" Chronicle Online, Cornell University. ^ Hites, R. A.; Foran, J. A.; Carpenter, D. O.; Hamilton, M. C.; Knuth, B. A.; Schwager, S. J. (2004). "Global Assessment of Organic Contaminants in Farmed Salmon". Science. 303 (5655): 226–9. doi:10.1126/science.1091447. PMID 14716013. ^ a b Santerre, Charles R. (2008). "Balancing the risks and benefits of fish for sensitive populations" (PDF). Journal of Foodservice. 19 (4): 205–212. CiteSeerX 10.1.1.570.4751. doi:10.1111/j.1748-0159.2008.00111.x. ^ Schwager S. J. (2005) "Risk-based consumption advice for farmed Atlantic and wild Pacific Salmon contaminated with dioxins and dioxin-like compounds" Environmental Health Perspectives, May 1. ^ Hamilton, M. Coreen; Hites, Ronald A.; Schwager, Steven J.; Foran, Jeffery A.; Knuth, Barbara A.; Carpenter, David O. (2005). "Lipid Composition and Contaminants in Farmed and Wild Salmon". Environmental Science & Technology. 39 (22): 8622–8629. doi:10.1021/es050898y. ^ Elskus, Adria A.; Collier, Tracy K.; Monosson, Emily (2005). "Ch. 4 Interactions between lipids and persistent organic pollutants in fish". In Moon, T.W. ; Mommsen, T.P. (eds.). Environmental Toxicology. Elsevier. pp. 119–. doi:10.1016/S1873-0140(05)80007-4. ISBN 978-0-08-045873-1. ^ Foran, J. A.; Good, D. H.; Carpenter, D. O.; Hamilton, M. C.; Knuth, B. A.; Schwager, S. J. (2005). "Quantitative analysis of the benefits and risks of consuming farmed and wild salmon". The Journal of Nutrition. 135 (11): 2639–43. doi:10.1093/jn/135.11.2639. PMID 16251623. ^ "Russia Bans Norwegian Fish (2005)" (PDF). ^ "Hard Times for Norwegian Salmon (2006)" (PDF). ^ Fish and Seafood Survey – Environmental Contaminants – Food Safety – Health Canada. Hc-sc.gc.ca (2007-03-26). Retrieved on 2016-10-26. ^ Meat and Alternatives – Canada's Food Guide. Hc-sc.gc.ca (2012-11-19). Retrieved on 2016-10-26. ^ Dietary Guidelines. health.gov. Retrieved on 2016-10-26. ^ "Update of the monitoring of levels of dioxins and PCBs in food and feed". EFSA Journal. 10 (7): 2832. 2012. doi:10.2903/j.efsa.2012.2832. ^ Castle, Stephen (November 6, 2017). "As wild salmon decline, Norway pressures its giant fish farms". New York Times. Retrieved February 9, 2018. ^ Fleming, I. A.; Hindar, K; Mjølnerød, I. B.; Jonsson, B; Balstad, T; Lamberg, A (2000). "Lifetime success and interactions of farm salmon invading a native population". Proceedings of the Royal Society B: Biological Sciences. 267 (1452): 1517–1523. doi:10.1098/rspb.2000.1173. PMC 1690700. PMID 11007327. ^ Volpe, John P.; Taylor, Eric B.; Rimmer, David W.; Glickman, Barry W. (2000). "Evidence of Natural Reproduction of Aquaculture-Escaped Atlantic Salmon in a Coastal British Columbia River". Conservation Biology. 14 (3): 899–903. doi:10.1046/j.1523-1739.2000.99194.x. ^ Gardner J. and D. L. Peterson (2003) "Making sense of the aquaculture debate: analysis of the issues related to netcage salmon farming and wild salmon in British Columbia", Pacific Fisheries Resource Conservation Council, Vancouver, BC. ^ Hansen L. P., J. A. Jacobsen and R. A. Lund (1999). "The incidence of escaped farmed Atlantic salmon, Salmo salar L., in the Faroese fishery and estimates of catches of wild salmon". ICES Journal of Marine Science. 56 (2): 200–206. doi:10.1006/jmsc.1998.0437. ^ Lee, Kessina; Windrope, Amy; Murphy, Kyle (Jan 2018). 2017 Cypress Island Atlantic Salmon Net Pen Failure: An Investigation and Review (PDF) (Report). Washington State Department of Natural Resources. pp. 1–120. ^ Sea Lice and Salmon: Elevating the dialogue on the farmed-wild salmon story Archived 2010-12-14 at the Wayback Machine Watershed Watch Salmon Society, 2004. ^ Bravo, S. (2003). "Sea lice in Chilean salmon farms". Bull. Eur. Assoc. Fish Pathol. 23: 197–200. ^ Morton, A.; R. Routledge; C. Peet; A. Ladwig (2004). "Sea lice (Lepeophtheirus salmonis) infection rates on juvenile pink (Oncorhynchus gorbuscha) and chum (Oncorhynchus keta) salmon in the nearshore marine environment of British Columbia, Canada". Canadian Journal of Fisheries and Aquatic Sciences. 61 (2): 147–157. doi:10.1139/f04-016. ^ Peet, C. R. (2007). Interactions between sea lice (Lepeophtheirus salmonis and Caligus clemensii), juvenile salmon (Oncorhynchus keta and Oncorhynchus gorbuscha) and salmon farms in British Columbia. M.Sc. Thesis, University of Victoria, Victoria, British Columbia, Canada. ^ Krkošek, M.; A. Gottesfeld; B. Proctor; D. Rolston; C. Carr-Harris; M.A. Lewis (2007). "Effects of host migration, diversity and aquaculture on sea lice threats to Pacific salmon populations". Proceedings of the Royal Society B: Biological Sciences. 274 (1629): 3141–9. doi:10.1098/rspb.2007.1122. PMC 2293942. PMID 17939989. ^ Morton, A.; R. Routledge; M. Krkošek (2008). "Sea Louse Infestation in Wild Juvenile Salmon and Pacific Herring Associated with Fish Farms off the East-Central Coast of Vancouver Island, British Columbia" (PDF). North American Journal of Fisheries Management. 28 (2): 523–532. doi:10.1577/M07-042.1. ^ Krkošek, M.; M.A. Lewis; A. Morton; L.N. Frazer; J.P. Volpe (2006). "Epizootics of wild fish induced by farm fish". Proceedings of the National Academy of Sciences. 103 (42): 15506–10. doi:10.1073/pnas.0603525103. PMC 1591297. PMID 17021017. ^ Brooks, Kenneth M.; Jones, Simon R. M. (2008). "Perspectives on Pink Salmon and Sea Lice: Scientific Evidence Fails to Support the Extinction Hypothesis". Reviews in Fisheries Science. 16 (4): 403–412. doi:10.1080/10641260801937131. ^ Ford, Jennifer S; Myers, Ransom A (2008). "A Global Assessment of Salmon Aquaculture Impacts on Wild Salmonids". PLoS Biology. 6 (2): e33. doi:10.1371/journal.pbio.0060033. PMC 2235905. PMID 18271629. ^ Larkin, Kate (3 September 2010). "Canada sees shock salmon glut". Nature News. doi:10.1038/news.2010.449. ^ Marty, G. D.; Saksida, S. M.; Quinn, T. J. (2010). "Relationship of farm salmon, sea lice, and wild salmon populations". Proceedings of the National Academy of Sciences. 107 (52): 22599–604. doi:10.1073/pnas.1009573108. PMC 3012511. PMID 21149706. ^ a b c Knapp G., Roheim C. A. and Anderson J. A. (2007) Chapter 5: The World Salmon Farming Industry in The Great Salmon Run, Report of the Institute of Social and Economic Research, University of Alaska Anchorage. ISBN 0-89164-175-0. ^ Salmon That Grow Up Fast Business Week, 16 January 2006. ^ Fast Growing GM Salmon Swims Close to US Markets The Fish Site, 11 February 2009. ^ Medicine, Center for Veterinary. "Genetically Engineered Animals - AquAdvantage Salmon". www.fda.gov. Retrieved 2017-06-19. ^ Devlin, R. H.; d'Andrade, M.; Uh, M.; Biagi, C. A. (2004). "Population effects of growth hormone transgenic coho salmon depend on food availability and genotype by environment interactions". Proceedings of the National Academy of Sciences. 101 (25): 9303–8. doi:10.1073/pnas.0400023101. PMC 438972. PMID 15192145. ^ "Fish farmer sponsors new aviary for injured eagles". ABC News. 2014-06-16. Retrieved 2015-11-09. ^ Aquaculture Stewardship Council, (ASC) (2017). ASC Salmon Standard (V1.1). https://www.asc-aqua.org/wp-content/uploads/2017/07/ASC-Salmon-Standard_v1.1.pdf: ASC. ^ a b Heen K. (1993). Salmon Aquaculture. Halstead Press. ^ a b Sedgwick, S. (1988). Salmon Farming Handbook. Fishing News Books LTD.
^ Bromage, N. (1995). Broodstock Management and Egg and Larval Quality. Blackwell Science. ^ Mills D. (1989). Ecology and Management of Atlantic Salmon. Springer-Verlag. ^ FAO: Species Fact Sheets: Salmo salar (Linnaeus, 1758) Rome. Accessed 9 May 2009. ^ Marine Harvest (2018). Integrated Annual Report 2017 - Leading the Blue Revolution. http://hugin.info/209/R/2177429/840178.pdf: Marine Harvest. p. 246. ^ a b FAO: Species Fact Sheets: Oncorhynchus mykiss (Walbaum, 1792) Rome. Accessed 9 May 2009. ^ "BC Fish Facts-Steelhead" (PDF). British Columbia Ministry of Fisheries. Retrieved 2013-11-28. ^ Bullock, G. L. and Cipriano, R. C. (1990) LSC – Fish Disease Leaflet 82. Enteric Redmouth Disease of Salmonids. U.S. Department of the Interior, Fish and Wildlife Service. ^ FAO: Species Fact Sheets: Oncorhynchus kisutch (Walbaum, 1792) Rome. Accessed 9 May 2009. ^ Foodies...FREAK! Copper River Salmon Arrive. Seattlest (2006-05-16). Retrieved on 2016-10-26. ^ "Alaska Statutes – Section 16.40.210.: Finfish farming prohibited". Findlaw. Retrieved 2015-01-21. ^ FAO: Species Fact Sheets: Oncorhynchus tshawytscha (Walbaum, 1792) Rome. Accessed 9 May 2009. ^ a b c Marine Aquaculture MFish. Updated 16 November 2007. ^ History of Ballyconneely from earliest settlers to the present day connemara.net. Retrieved 26 May 2009. ^ Newton, Chris (2013). "The Strange Case of the Disappearing Salmon". The Trout's Tale – The Fish That Conquered an Empire. Ellesmere, Shropshire: Medlar Press. pp. 57–66. ISBN 978-1-907110-44-3. ^ Newton, Chris (2013). "Scotland with Lions". The Trout's Tale – The Fish That Conquered an Empire. Ellesmere, Shropshire: Medlar Press. p. 106. ISBN 978-1-907110-44-3. ^ Newton, Chris (2013). "Falklands' Silver". The Trout's Tale – The Fish That Conquered an Empire. Ellesmere, Shropshire: Medlar Press. p. 153. ISBN 978-1-907110-44-3. ^ Newton, Chris (2013). "The Monsters of Kerguelen". The Trout's Tale – The Fish That Conquered an Empire. Ellesmere, Shropshire: Medlar Press. p. 163. ISBN 978-1-907110-44-3. ^ "Billions of jellyfish wipe out salmon farm". MSNBC. November 21, 2007. Retrieved 28 January 2010. ^ The National (29 March 2019). "Desert salmon farming becomes reality for Dubai-based company". Coimbra, João (1 January 2001). Modern Aquaculture in the Coastal Zone: Lessons and Opportunities. IOS Press. pp. 32–. ISBN 978-0-9673355-6-8. Harris, Graeme; Milner, Nigel (12 March 2007). Sea Trout: Biology, Conservation and Management. Wiley. pp. 18–. ISBN 978-1-4051-2991-6. Knapp G., Roheim C. A. and Anderson J. A. (2007) The Great Salmon Run: Competition between Wild and Farmed Salmon Report of the Institute of Social and Economic Research, University of Alaska Anchorage. ISBN 0-89164-175-0. Lustig, B. Andrew; Brody, Baruch A.; McKenny, Gerald P. (1 November 2008). Altering Nature: Volume II: Religion, Biotechnology, and Public Policy. Springer Science & Business Media. pp. 321–. ISBN 978-1-4020-6923-9. Pomeroy R., Bravo-Ureta B. E., Solis D. and Johnston R. J. (2008) "Bioeconomic modelling and salmon aquaculture: an overview of the literature" International Journal of Environment and Pollution 33(4) 485–500. Quinn, Thomas P. (2005). The Behavior and Ecology of Pacific Salmon and Trout. American Fisheries Society. pp. 18–. ISBN 978-0-295-98457-5. BC Salmon Farmers Association - Trade association representing salmon aquaculture industry in British Columbia, Canada. CAIA – Canadian Industry Aquaculture Association Canadian association representing all salmon farms in Canada. Positive Aquaculture Awareness Independent association which promotes salmon farming in British Columbia, Canada. What about this fish? – Video extract from Harvest of Fear.